Just About Anything: Scaly Water Pot? 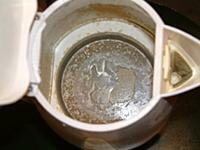 Ever noticed your hot water pots? If you take a look at the side and at the bottom, you will notice that there are solid materials encrusted especially in the hottest area of the kettle. These are called scales or limestone deposits. They are most common especially when you live in areas where your water supply is hard water, which means that your water has a high level of minerals dissolved in it. This limestone deposits must be removed from time to time since this will render your kettle inefficient when you are boiling water. Thus, the need for a longer time to boil your water. How to remove? Easy! Just use an acid... Vinegar will do. Place vinegar into the water pot and allow it to boil. Boiling will make the process of descaling faster. Once the limestone deposits have dissolved, discard the water and clean. You may also use other descaling products that contain citric acid. So easy eh? uwi sa Pinas di ba? Btw, si Sam does walk na ba? Si YL ko di pa rin eh? Thanks for the tips.. now I know how to get rid of that scaling..